Hank Lentfer, author and lifelong Alaskan, helped establish a 4,000-acre refuge for Sandhill Cranes—the Gustavus Forelands Preserve. 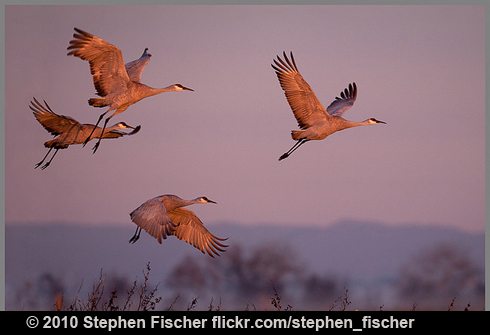 Today, some 20,000 Sandhill Cranes use the preserve to rest and refuel. Along the way, they've helped Hank make his own journey—one from despair to hope. "It's easy in the avalanche of grim news to feel isolated, but it's in the act of joining others to speak for what you love that you can feel a kindred spirit with all these other people." Hank Lentfer, author and lifelong Alaskan, helped establish a 4,000-acre refuge for Sandhill Cranes. Every fall and spring, the cranes stop at the Gustavus Forelands Preserve to rest and refuel. Many are migrating between the Arctic and the rice fields of California. Today, some 20,000 Sandhill Cranes use the preserve. [Calls of Sandhill Cranes] Along the way, they’ve helped Hank make his own journey – one from despair to hope. I live in what feels to me like the center of paradise. But when efforts were ramping up to send oil rigs into the Arctic Refuge, I got pried out of my little refuge. Hank petitioned Washington, joined his local town council, and became a voice for a tax on carbon. Find a link to Hank Lentfer’s book, Faith of Cranes, on our website, birdnote.org. Sounds of the Sandhill Cranes provided by The Macaulay Library of Natural Sounds at the Cornell Lab of Ornithology, Ithaca, New York. Small flock  and large flock  recorded by A.A. Allen, individual  recorded by G.A.Keller. Sounds of Sandhill Cranes used behind Hank’s narrative recorded by Richard Nelson.